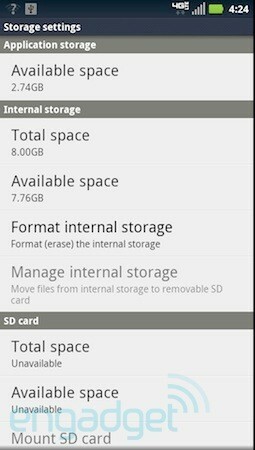 If you picked up the Droid 4, you might notice that you can only use 8 out of the 16 GB's that was marketed with the device. Like how the Razr was set up, there was space picked out for what you can use. In this case, you have 8 GB for you to use, 5 GB for the OS and updates that come with it, and finally 3 GB for apps that you install. So I hope this clarified any worries from the community. Photo was provided nicely by Engadget.